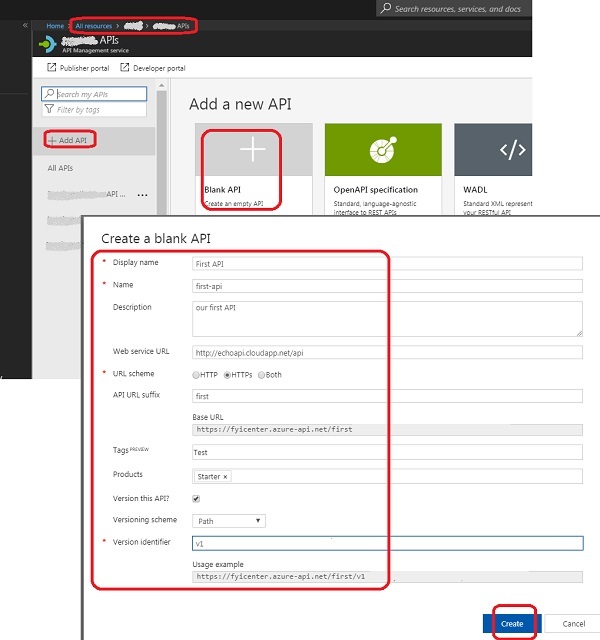 How to create a new API on the Publisher Dashboard of an Azure API Management Service? If you are new to the Publisher Dashboard of an Azure API Management Service, you can follow this tutorial to a new API. 1. Log in to the Publisher Dashboard as shown in the previous tutorial. 2. Click APIs from the menu. You see the API list page. 3. Click "+ Add API" on the API list page. You see the new API form. 4. Select "Blank API" template. 6. Click "Create" button. A new API will be created. Now you have an empty API waiting for operations to be added.